You are here: Home / Recent News / Why Vote in the MAMA Awards? Why Vote in the MAMA Awards? 1). ARTISTS: There is a little-known fact about the MAMAs’ voting process. Similar to other awards programs, three categories of voters all carry different weight. That’s because several years ago it was decided that those registered as artists should have a larger say in who is getting selected. The most weight goes to artists who submitted to the same category – whether or not you ended up as a finalist. The next level goes to the rest of those who submitted to any other category. The balance goes to those registered as fans. So you, the artists, have a higher stake in who is selected. The process has been scrutinized so much over the years and the current system is what the MAMAs think is most fair and the most inclusive. 2). FANS: Your participation means that the more categories you vote in, the more voice you have in determining the outcome. Fans, because of their sheer number, often determine who is winning the awards. Your participation creates revenue that goes directly to the charitable mission, providing instruments and funds for music programs for Madison-area youths. Here’s a statistic that might interest all of those considering becoming involved: Before 2018 is out the MAMAs will have given out $100,000 + in instruments and funds. And that is just the Music Education Fund. 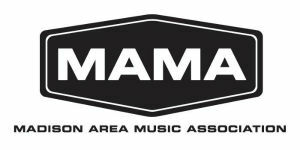 MAMA has two other funds: MAMA Cares, which has already given out $10,000+ in medical and survivor gifts to Madison musicians and/or their families; and the MAMA Clyde Stubblefield Scholarship Fund that will award funds to area applicants moving on to higher education that includes music. Last year, some of the speakers who participated in the first Between the Waves Music Conference & Festival attended the MAMA Awards and some of them volunteered as presenters. These are some very big, well-known names in the music industry and in music technology. Without a fault all of them were taken aback by what we have going on here. Madison is truly unique in the way it is building community, fostering the next generation of artists and recognizing those who live and work in the city. It’s a phenomenon that should be nurtured and supported because none of it happens without your participation. To sign up and to vote, go here. Hurry! Voting ends May 7. That’s also the last day MAMA will accept nominations for Student and Teacher of the Year. David Spero, Legendary Manager -Kenny Loggins, Joe Walsh, (BTW Speaker): “I just want to thank you for an amazing experience at the BTW conference. I came up there as a speaker, but left with a lot more knowledge of my business than I came with. I was very impressed with the wealth of talent in your area. I saw over a dozen artists perform, and as a result, I’m currently talking to a couple of them to possibly join my roster at my management company. Craig Anderton, Executive Vice President, Gibson Guitars (BTW Speaker): “I’ve presented seminars in 38 states, 10 countries, and in 3 languages, and have participated in many similar events over the past four decades. The first year for any kind of conference is always difficult, but BTW laid a solid foundation so that the event can grow. The level of organization was above average. The choice of topics to be covered was a good mix of technical, business, and art so the focus was not too narrow. Frankly I was not aware of what was happening in Madison prior to being asked to participate. I did a fair amount of research and it seemed there was a “scene” bubbling under the surface. I assume a reason why BTW brought in speakers from outside the area was so that we would make others aware of what was happening. Coordinating BTW with concerts in various live venues around Madison was brilliant, as was linking to the MAMA awards, because it created a more cohesive picture of the arts in Madison. It was also an opportunity to appreciate the Overture Center for the Arts.